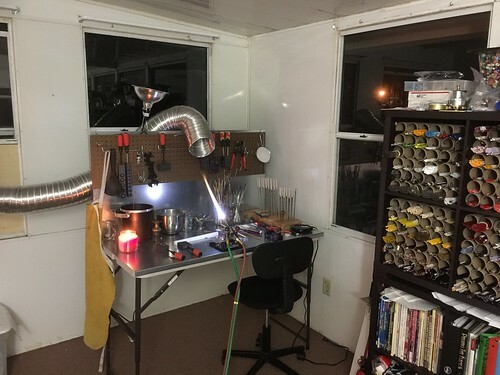 The studio in my new house - Lampwork Etc. 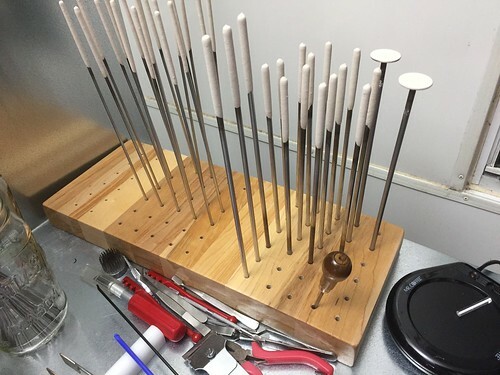 My mandrel holder that my roommate made out of some old cutting boards. This works so much better than the bowl of sand I was using. The only thing not pictured is the kiln which currently sits to the right of my main glass storage. I'll be moving it closer as soon as I can figure out where. This is in the "Florida room" in the new house. I should be able to torch almost all year round. Thanks! It's been so long since I've been able to torch that I now have to re-learn a bunch of stuff, but I'm looking forward to it. 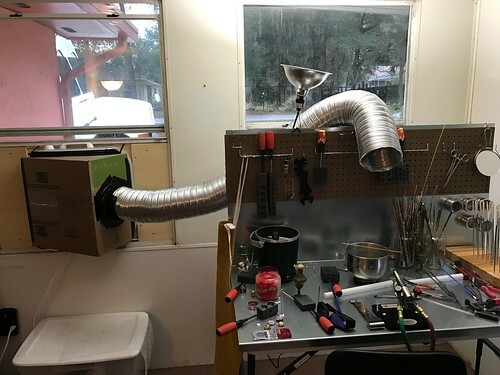 And I ended up buying a rolling cart from Harbor Freight for my Chilipepper, but I'm not sure how big your kiln is and if that would work for you. I can push it out of the way until I need it, then pull it out away from everything a bit. That's a great idea. I currently have it on one of those three shelf wire racks. As it's a regular guy from Glass Hive I think that might work. 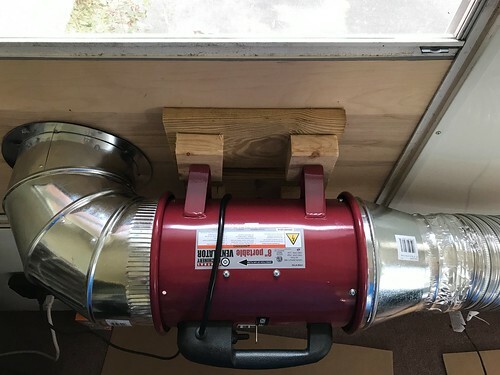 What sort of vent blower do you have? I like how simple the setup seems. That looks great = have an amazing time! Setup looks great, it'll all come back to you in a jiffy. My vent system is something we rigged up and are testing. I know folks have gone back and forth on the use of a box fan, but that is what I'm using. On the front of the box fan is what looks like a big wedge of cheese made out of cardboard. The vent tube (whatever you call it) is on the big end of the wedge. Running the fan on "3" pulls a lot of air through it. After trying all of the smoke tests and what not it all seems to work well. We do have a flange that takes the 6" hose to 8" but it isn't on yet. The box fan is mounted to some wood that we cut so that it fits the window. That way I can pull it out of the window when I'm done and close it. Once we get a little bit more time we'll make the wedge out of wood and permanently attach it to the fan. It's currently being held on by gorilla duck tape (which also plugs any potential leaks). I'll post pictures later today. I didn't realize that it wasn't in the photo originally. Since I can't cut through the wall or permanently block the window, this is what works for me. So far I think my cost for this is around $60 if not less. We already had the wood and tape. The fan was under $20 and the hose and two adapters were under $40. This is it not installed in the window. The hose itself isn't very bendy so the plastic container needs to be there to support it when it isn't in the window. I didn't want to have to mess with the hose as well as the fan. In the window - the fan is blowing outside. I have a window behind me that gets opened for intake. Cool setup! Does it pass the smoke test? 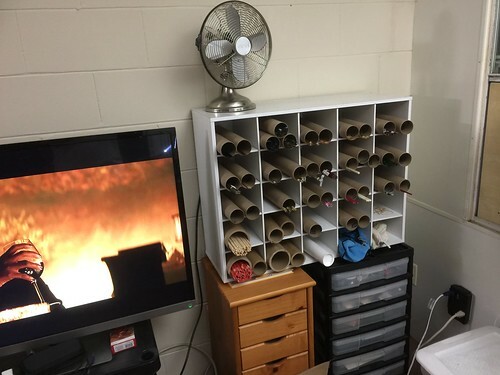 Box fans can sometimes not be enough power. I used one for awhile but it was not great. 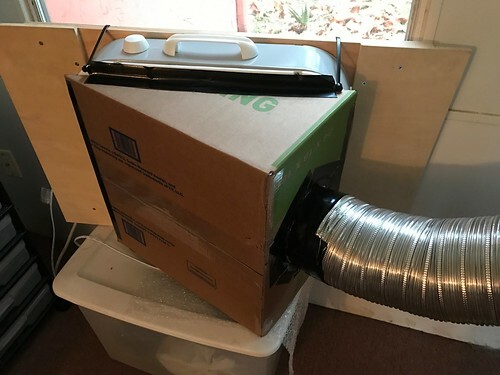 I ended up getting a hydroponic fan online and creating a similar set up as yours but with the hydroponic fan. The suction is amazing and I don't have to worry. Yes. It passes the smoke test. I'm always amazed when I watch it get pulled into the hose. 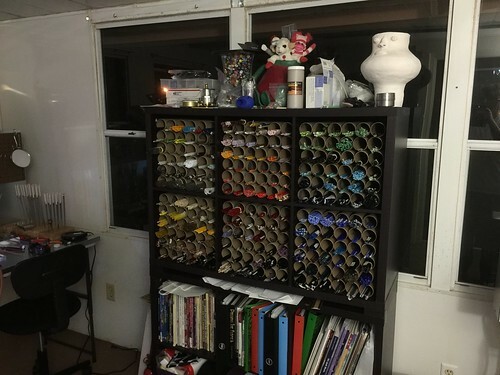 accbyruth - that looks super manageable! I'm trying to tidy up my vent system before I jump up from my hothead. Right now I've been using just a box fan slightly beyond and above my work surface. This looks like a far more reliable setup. Thanks. It can be a little unwieldy sometimes, but it works like a charm. Most of the time I like that I can remove it from the window so that it can be locked. You also have to watch for the hose splitting when it gets moved around to much. After moving the fan into the window I check all of the tape to make sure none of it has unstuck. It doesn't really happen, but best to make sure. Of course there are many better ways of connecting things (like hose clamps) but sometimes you got to use what you have. 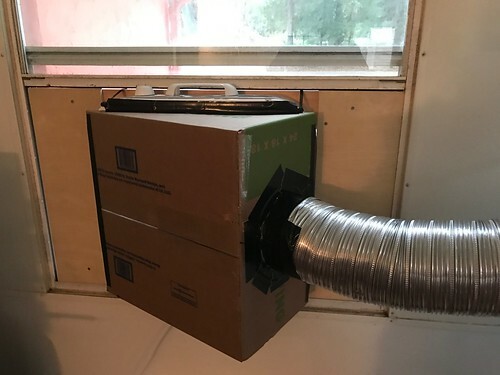 I've finally updated the ventilation system to something more permanent. Now, it stays in the window full-time, but could be removed it necessary. I purchased all of the duct pieces at Lowe's and the fan itself from Harbor Fright using a 20% off coupon. The fan airflow is 1380 cfm on low and 1590 cfm on high. The noise isn't too bad either. I just play my music louder. The end of the duct still drapes over the top of my work bench.